I grew up in Casco, Maine and received my BFA from Maine College of Art after transferring from Ringling College of Art in Sarasota FL. Making fish has been enjoyable as they are accessible and have endless possibilities. Fish are such a diverse and ever-changing species. There is a seemingly endless variety of shapes, colors and sizes in the world under the waves and fish are a digestible entry point for me. In between the scales and fin, I leave room to tell my own tail. 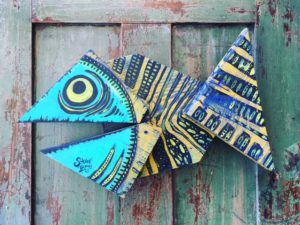 I’ve always enjoyed using found materials in my art -it allows me a freeness. 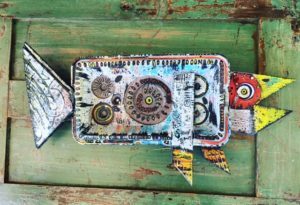 My fish are made from salvaged materials in, on and by the road all over Maine. My father was the one who taught me that you can turn debris into design. When I was younger, I remember stopping to pick up bungie cords, wood and other discarded items. I carry his eye with me when I make fish. I’ve use guitars, cooler lids, 80’s toys, driftwood and just about anything I can. Posted in Artwall, Tearoom Events.